Healthy aspens are some of my favourite trees. The way the leaves quake in the summer breezes reminds me of simpler times, of the carefree days of my youth. Trembling aspens are also a very successful species throughout North American, resisting extremes of temperature and a host of insect and disease problems. The largest and most majestic trembling aspen that I have personally seen were northwest of Fort Nelson, B.C., with trunks in excess of 50cm in diameter at breast height and massive crowns above. Sadly, these trees are routinely removed for oil and gas pipeline right-of-ways. Trembling aspens are highly variable in their height and health, depending on the growing site. The best specimens grow in leafy woodlands in well-drained forest soils. Aspens growing in heavier clay soils, combined with drought and open exposure to the wind, are generally smaller, and much more prone to fungal cankers and insect problems, such as poplar bud-gall mites and green aphids. If you want to plant trembling aspen in your yard, provide a well-drained growing medium with a mulched tree well or bed. Ensure adequate irrigation, especially during extended dry spells. Purchase locally-grown plant stock if available. 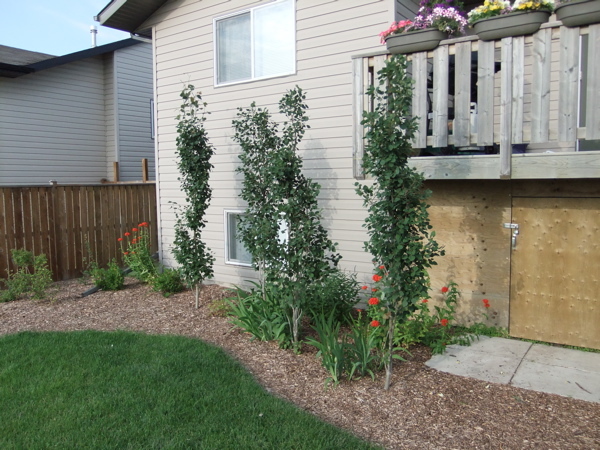 I once planted three aspens in my Calgary yard that were grown from local seed stock and all three trees are doing well. Most of the trembling aspens that I am called upon to prune are in woodland settings, such as acreages and yards that border natural areas and parks. To improve the aesthetics of a natural area, I may remove dead trees that have fallen into live ones, and I may remove deadwood up to about 12’, with a pole saw or pole pruner. I rarely climb these trees to perform maintenance. Occasionally, however, it is necessary to remove large dead tops, or broken limbs, that are potentially hazardous. Pruning Time: Dormancy. Late winter to early spring is ideal. As with most species, you can safely remove up to 10% of the canopy anytime of year. Avoid pruning during bud-break up until the leaves are expanded. Structure: prune as a central leader standard with well spaced scaffold branches (see scaffold training). Remove the weaker of crossing and rubbing branches. Health: Remove deadwood each season. Prune twigs with hypoxylon canker. On young trees, remove twigs that are infested with poplar bud-gall mite. People tend to love or hate these trees, with not a lot of middle ground. Personally, Swedish aspens have slowly won me over as a valuable ornamental for the Prairies. They grow very quickly, especially if well planted and cared for, and therefore provide quick privacy between closely packed houses, and quick shade for the west facing bedrooms in newer communities. They are relatively low maintenance. In central Alberta, where I live, Swedish columnar aspens are becoming infected by Bronze Leaf Disease (BLD). This is a serious problem that has spread west across the prairies from Manitoba. There is no fungicide to combat this disease and infected trees can die within three to five years. 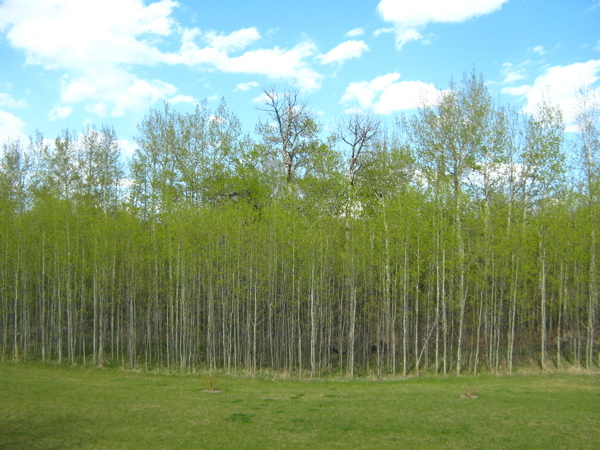 BLD can attack a wide range of poplars, including native trembling aspen, and can have a devastating impact on local populations. I have been treating BLD in a number of ways. Prevention is the best first line of defence. Low stress trees that are mulched and irrigated, with adequate nutrition, tend to resist infection. Infected trees are most noticeable in August, when flagging branches with bronze-coloured foliage appears. It is important to remove infected limbs as soon as possible, as the disease spreads from the twigs and into the main trunk very quickly. Sanitize the area by removing all infested twigs and leaves and dispose of them by burial or burning, if possible. Pruning time: Dormancy. Late winter to early spring is ideal. Prune BLD-infected branches as they appear in August. Structure: Minimal maintenance required. If the trees gets snow loaded, a few branches may become wayward. Smaller wayward branches can be pruned back to an inward facing bud. Larger branches can be tied back to the main trunk using long zip-ties. Remove the ties after a season. Clearance prune the tree as it gets too close to eavestroughs or other structures. Health: Remove obvious deadwood each season. I am currently using fertilizer on my young trees to encourage shoot elongation. 30-10-10 works well for this. For general fertilizing applications, I prefer 11-26-27 plus micronutrients. Irrigation: Moist, well-drained soil is best. Plant trees in a mulched bed to avoid competition with surrounding lawns. Irrigate during extended dry periods.